Visual Studio Code>Other>vscode diagnostics searchNew to Visual Studio Code? Get it now. 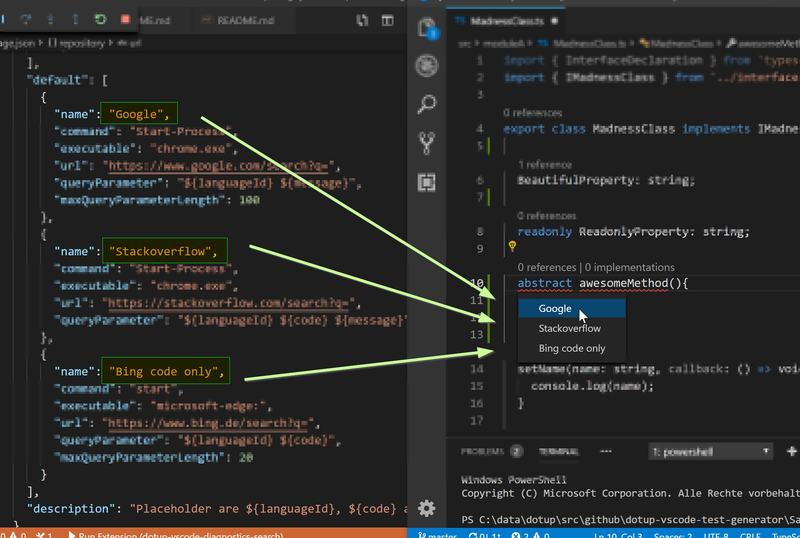 Diagnostic search is a VSCode Extension that extracts diagnostic messages and opens a browser with the selected issue message. Works with all languages. You can browse and install extensions from within VS Code. Press Ctrl+P and narrow down the list commands by typing ext install dotup-vscode-diagnostics-search. Place the cursor on detected issues (highlighted with red squiggles). Clicking on the Code Action lightbulb or using the Quick Fix command Ctrl+. will display your configured search entries. Select the desired entry and confirm with enter or mouse click. The extension opens a browser window with the selected error message. You can define your own entries. Each entry in the configuration file is displayed as a menu item in the context menu. queryParameter: Define the url arguments with placeholder.